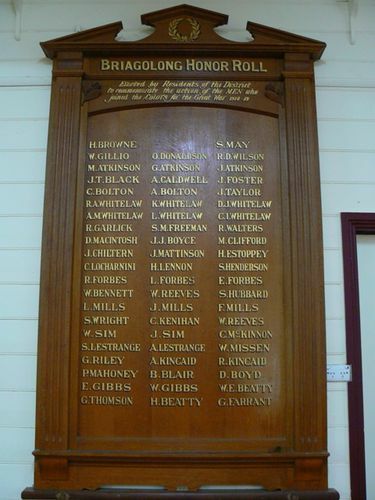 A wooden honour roll commemoratres those who served in World War One. 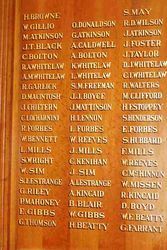 It was unveiled on Empire Day 1917 and contains the names the names of 62 volunteers inscribed in gold on an oak wood board. Mr Rayment, hon. sec. 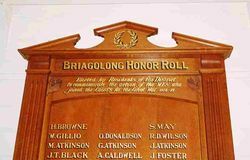 Briagolong Soldiers' Commemoration Committee, writes: " My committee desire to inform the public that the unveiling of the Briagolong Honour Roll will take place in the afternoon of Empire Day, May 24, 1917. 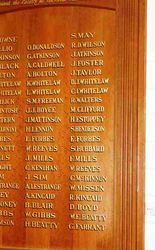 The Roll is a beautiful piece of Oakwood work 7ft x 4ft (manufactured by Cox and Co., Melbourne) and 62 volunteers' names are inscribed thereon in letters of gold. A complete program has been arranged for the day mentioned, and, in conjunction with the local school committee, a number of soldiers' portraits will be unveiled at the school in the forenoon. Lunch will be served al fresco, at midday. It is hoped that a large gathering will be present to honor the modest tokens erected to perpetuate the gallant action of our young heroes who have so unselfishly yielded up their young lives that we may live in peace. It is fortunate that the unveiling will synchronize with the day denoted to the inculcation of patriotism, and who would dare affirm that such exhibitions do not contribute towards the development of that proud citizenship which has produced from the four quarters of the globe eager volunteers for the defence of our great Empire. Special invitations will be posted to soldiers' relatives, and some prominent men will be present to deliver addresses. My committee, therefore, extend a cordial invitation to the public to join in, and thus show a modicum of gratitude to those who have fought, and to those who are now fighting, the great battle that Liberty, Truth, and justice might prevail." 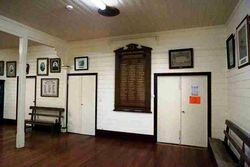 Maffra Spectator (Vic. ), 5 April 1917.